We all recognize the value in maintaining a presence on at least a couple social media platforms. But I’ve got some hard news for you. Unless you’re using analytics or some sort of tracking system, you’re probably just wasting your time. Simple: if you don’t have any idea about the performance of your ads, or the effectiveness of your campaigns, or even the engagement on your posts, then you won’t know whether you should keep doing the same thing, or if it’s time to cut your losses and try a different strategy. In short, analytics is your secret weapon when it comes to social media, and your website and blog’s performance too, and you’ll want to ensure that you don’t fire up any new campaigns without it. When it comes to social media platforms –for many businesses, Instagram is the place to be. Currently, there are 800 million monthly active Instagram users. And, by all indications, this audience –is a lot more active than other social network users. A recent study by Forrester Research found that Instagram users were 58 times more likely to like, comment, or share a brand’s post than Facebook users and 120 times more likely than Twitter users! 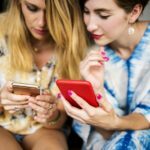 The data shows the users are migrating from Twitter and Facebook, and continually spending more and more time on Instagram. For brands and businesses today, now is absolutely a good time to jump onboard the Instagram bandwagon, and get in while it’s hot! Now that we’ve got that out of the way, let’s remember your main objective on Instagram: to get as many followers as you can to engage with your brand. With this in mind, let’s take a look at some things that you can do to track, measure, and increase engagement. We’ll also look at a few third-party tools that can make the job easier. Seems basic right? You’d be surprised! Before we get any farther, let’s take a look at a few things you’ll want to NOT do with your Instagram account. 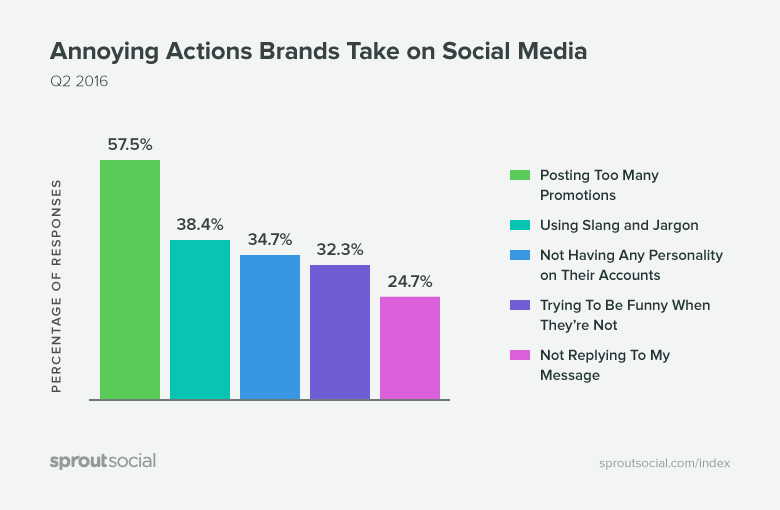 According to a Sprout Social survey of 1000 social media users, there are five main annoyances that people reported having with brands on social media. Yikes! Sounds a bit like a bad date! Anyways, if you were to take the results of this survey and apply them to your Instagram usage, here are some things you could do. 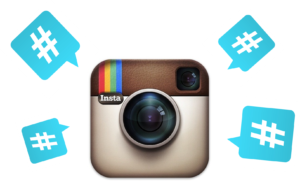 Spread out the number of promotions that you offer on Instagram. A good idea would be to limit your promotions on Instagram to holiday sales or other common dates when Instagrammers would expect promotions. Another opportune time to have a promotion could be your company’s anniversary sale. Avoid using slang or jargon. All too often, companies try to sound hip and cool to be in with the group –but really, an overload of jargon just makes them sound forced. Speak in the language that your audience is accustomed to, and don’t try way too hard to be hip. As your brand evolves, look to see what makes your brand shine and attract people. Embrace that. What can you do to differentiate yourself from the competition and attract followers? Humor’s great, but again, don’t try too hard. It’ll sound forced. Humor in your posts has to be relevant and within the general bounds of your audience’s tolerance. Remember your personal sense of humor may not mesh with your audience. When in doubt, don’t. 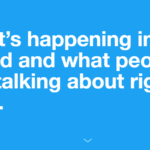 Finally, make sure that you engage with your followers. If someone takes the time and effort to ask a question or make a comment, then make sure you respond, even if it is just a simple “Thanks.” Even if they ask a question that may seem overly simplistic to you, make sure to respond in a manner that makes them feel as they are the most important and influential person in the room. They just might be! Plus, others will see your interaction as well, and that’s good for your brand. Now, let’s move on to some things that you most definitely should be doing on Instagram. First, you’re going to need a systematic approach for keeping track of all the data that you’ll gather. One of the best ways to get started is to create a performance spreadsheet. Start by using a simple tool –like an Excel sheet. List your metrics that you’re tracking in a column on the left-hand side, and list the months of the year horizontally out along the top. Then, each month you’ll be able to fill in the data to see what’s changed –and to track valuable metrics –like your growth rate. Now, say you want to see how many new followers you’re getting each month. Add a line to your spreadsheet for ‘New Followers.’ To find this number, take the total followers for the month and subtract the previous month’s total followers. This gives you the total new followers for each month. Next, add a line to your spreadsheet for ‘Growth Rate.’ To find this number, take the total new followers for the month and divide by the previous month’s total followers. Then take this figure and multiply it by 100. 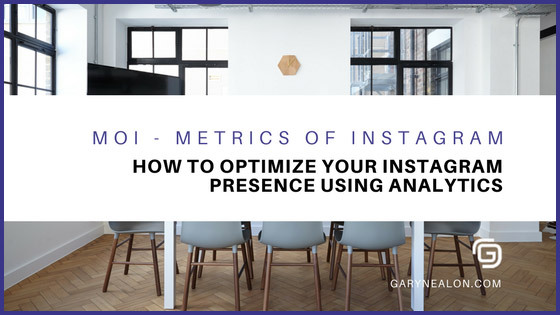 Social Media Examiner has shared an extremely useful article with tips for tracking your metrics on Instagram, and it’s worth reading and implementing some of the ideas in it. Instagram Insights is Instagram’s analytics page. Think of it as your own personal secret agent that will fill you in on who your followers are, when they’re on Instagram, and what they’re doing. All in a very non-stalker way, of course! Even though Instagram and Facebook operate as separate platforms, the fact is that –because Instagram’s owned by Facebook, they use each other’s resources. This is good news for you because it means you’ll have even more powerful analytical tools and insights at your disposal. 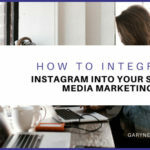 Note: If you are just getting started on Instagram and are still familiarizing yourself with this incredible marketing tool, read this article to get up to speed on all things Instagram: How to Implement Instagram Into Your Social Media Marketing Plan. To get started with Instagram Insights, just click the bar chart icon on your profile. Insights will give you the option to either view your profile or look at the data from a particular post. Impressions: The total number of times your post was viewed. This may include multiple views by the same Instagrammer. Reach: This is the number of unique accounts that have seen your post. Website Click-Throughs: The number of accounts who have tapped your website link on your Instagram business profile. Follower Activity:The average time of day your followers are on Instagram each day. Impressions: The total number of times the post was seen. Reach: The number of accounts that have seen your post. 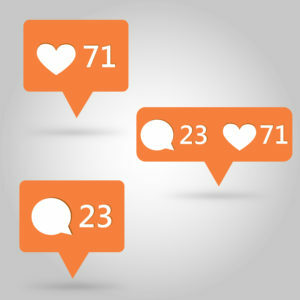 Engagement: The number of unique Instagram accounts that liked or commented on your post. Now that we know what data is available, let’s take a closer look at the various metrics you can measure –and what you can do to improve your engagement and reach. 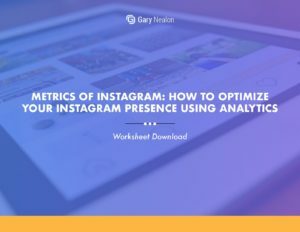 Get our Metrics of Instagram Worksheet delivered right to your inbox. Obviously, followers matter a lot. The more followers you have, the greater your reach. 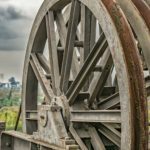 If you notice a sudden spike in followers, take a look at what you’ve been doing differently lately. And if you go an extended period without gaining followers, see what needs to change in order to get momentum going again. This is a metric that doesn’t need to be measured each day but rather over incremental periods like seven days, 30 days, or quarterly. Iconosquare is a handy tool that can give you valuable insight on your followers. This includes growth, location, gained and lost followers, and the most influential people that follow you. Good hashtags make it easy for new people to find you. The best strategy for hashtags is to use a combination of general and specific hashtags. For example, if you are selling running shoes then a general hashtag would be #RunningShoes, and a specific hashtag would be #NikeRunningShoes. Hashtag metrics is about finding the right combination of hashtags that are going to get the most engagement. Instagram allows 30 hashtags currently, and while you don’t have to pack out each post to the max, it could be said that the more you use, the better your chances of being found. Have a look at popular brands on Instagram to see what their hashtag strategies are. You could even get some ideas by seeing what your competitors are using. Top Hashtags is a great tool that will help you to find specific hashtags that are popular. You may also want to check out Hashtagify.me and Keyhole for more help finding relevant hashtags. Engagement is any interaction with your account. This includes the comments, likes, and click-throughs, and shares on your account. The goal of every Instagrammer is a high number of engaged followers who like, comment, and share their content. You’ll also want to encourage your followers to click through to your website to delve deeper into what you have to offer. Your engagement rates will improve if your followers are interested in your content, so be sure to share high-quality posts that are relevant to your current audience. 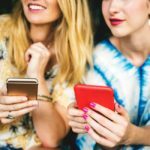 Another especially effective way to increase engagement, and grow your brand presence –is by using an Instagram influencer. Influencer marketing, put simply, is a referral system. Brands team up with an influencer that matches their brand and message, and then pay, hire, or inspire the influencer to promote their product. This usually involves them sharing an image of them using the product, along with the brand’s hashtag. With 81% of marketers who have used influencer marketing determining it to be effective, it may be worth considering this option if you’re looking to drastically increase your Instagram presence. Likes are the most basic of all the engagements, but they’re an accurate indicator that you’re posting engaging content. In regards to tracking likes, try to look for patterns. What types of posts are getting the most likes? When do your images tend to get the most likes? What is the difference in the demographics of people who just like your posts compared to those who comment? Comments are usually a good sign that people like your posts. And compared to likes, comments give more weight to your content. They’ll also make it easier for people to find you. Consider using a tool like Simply Measured to track comments and other valuable metrics on Instagram. Keep track of the posts that get the most comments and watch for similarities between the ones that get the most engagement. These are the types of posts that you want to continue to post. Which types of posts are getting the most comments? Product photos? Behind the Scene Photos? Videos? Quotes? If you have people that are routinely commenting, reach out to them. Follow them back or at least comment on some of their photos as well. Finally, don’t forget that you have to be friendly to make friends. Look for people or brands that are related to your industry in some way, and follow them. If you’re using Instagram to drive traffic to your website or blog, you’ll want to track click-throughs to your website. Use Instagram Insights to see the total number of click-throughs. Just tap the bar graph icon in the upper-right of your profile to see how many times the link in in your bio has been clicked for a specific time period. The easiest way to get clicks to your website is to put a website link in the bio of your profile. 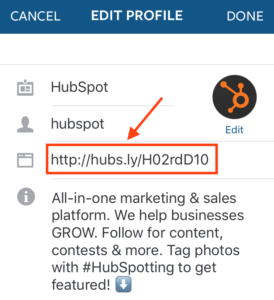 You could also place a call to action in some of your Instagram posts, and include a Bitly link or vanity URL. This will let you know where your clicks are coming from. Another idea is to put a text overlay with a link to your website in your videos, and mention the URL in the voice overlay of the video along with a clickable link in the content below the video. If you want more detailed information on your click-through rates, add Google UTM parameters to the links that you share in your Instagram bio. This will let you see how many people clicked the bio link, or which link that they clicked, and what they did after. The ultimate metric! With close to $3 billion in advertising revenue in 2016, Instagram is quickly realizing that their platform is a legitimate tool that businesses are using to attract clients. And consumers are using Instagram as a primary research tool to select products they have an interest in purchasing. To track conversions, consider adding four stages of your sales funnel to your performance spreadsheet. Then fill it in as the data comes in. 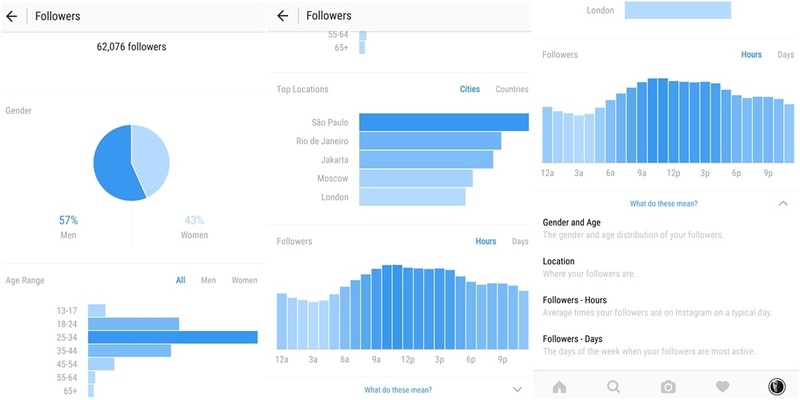 You can find most of the data –like reach and new followers in Instagram Insights. The best time to post is when your audience is watching! Fortunately, Instagram has this metric within their app under Follower’s Activity. 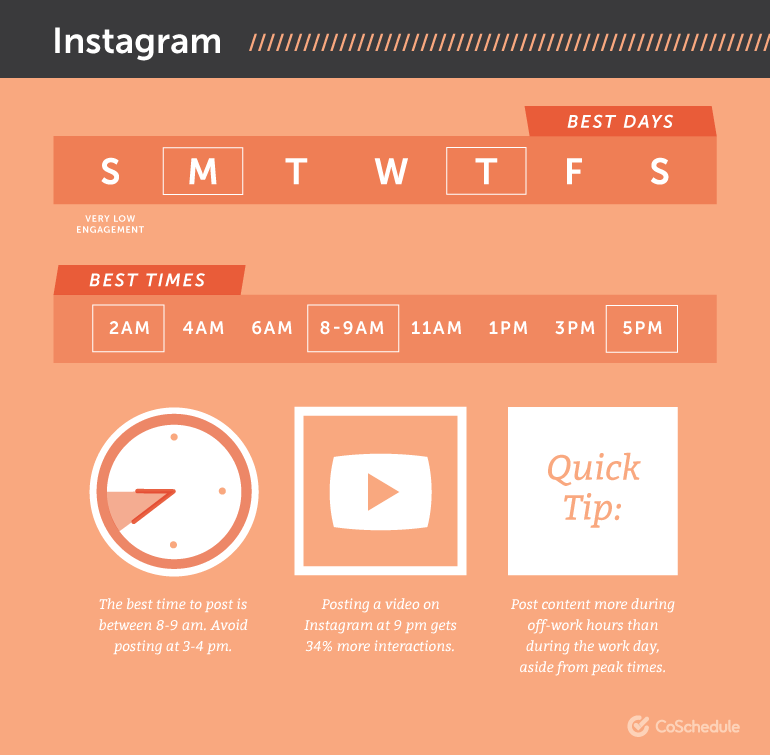 This will show you when your followers are most likely to be active on Instagram. Once you notice some patterns, take note. This is the best time to post your best content, to repost content, or run promotions. Try several combinations and as your followers increase you may notice additional times your audience is more likely to engage. Nathan Ellering has created a tremendously helpful guide on CoSchedule that provides some great advice on choosing the best times to post your content. Instagram is an exciting platform, but how much you gain from it will depend on how you’re using it! 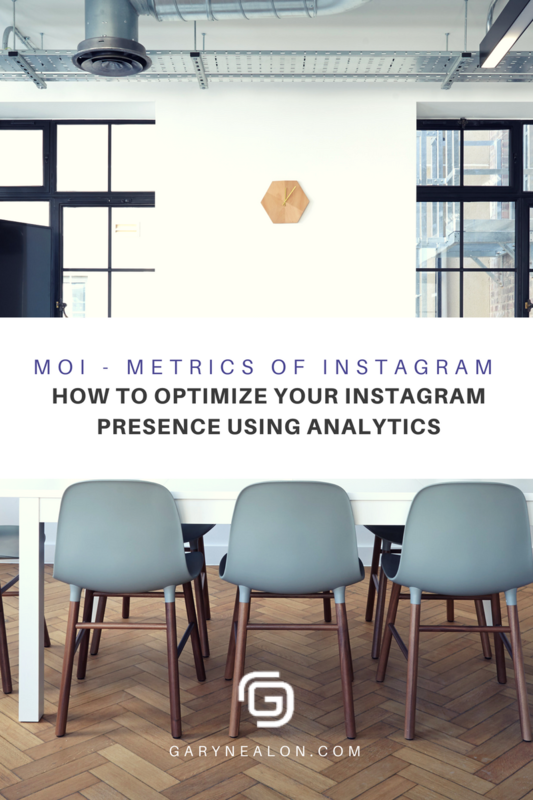 So make sure you’re taking full advantage of tools like Instagram Insights and Google Analytics. Measuring things like engagement, click-throughs, hashtags, and more are the best way to see what’s working for your audience, and will give you the data that you need to make the best content decisions. What Instagram metrics do you track?